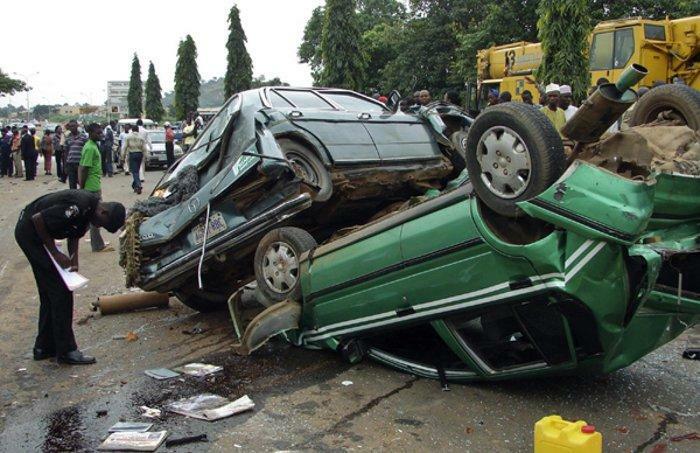 Seven persons were on Saturday killed in an auto crash at area J4 along Sagamu-Ijebu-Ode Expressway. The multiple crash occurred at about 5.30a.m involving 28 persons and three vehicles. The crashed involved a blue Ford bus with registration number Imo ETU 409 XA; a red DAF model truck registered Lagos KRD 908 XN and an unregistered truck. It was gathered that eight passengers were also injured in the crash but were rushed to the Hope Hospital in J4 area in Ijebu-Ode, Ogun. The Ogun State Sector Commander of Federal Road Safety Commission, FRSC, Clement Oladele, confirming the incident, blamed the crash on route violation and over speeding. “The fatal crash, was caused by route violation which we all refer to as one-way driving. “We have always warned drivers to desists from this reckless act which ultimately results in killing of innocent lives. “The FRSC would sanction heavily any driver caught driving against traffic and we are calling on passengers to also complain against such drivers breaking this violation. “They can report such incidents at the nearest FRSC Command or call FRSC toll free number 122,” Oladele said. The corpses have been deposited at the morgue at the State General Hospital in Ijebu-Ode.